So far Khybr Digital has created 2 blog entries. 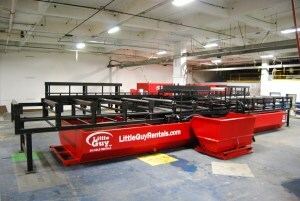 At Little Guy Oilfield Rentals, environmental responsibility and customer service are our top priorities. We work hard to offer our customers the best service possible, and that includes offering products that make your job easier. And since we live and breathe rig mats, both wood and composite, we had our MatWash 360°system custom built to exceed industry standards of cleanliness and efficiency. Our MatWash 360° system doesn’t just clean your mats in record time, it also recycles the water used in the process. An automated, portable, conveyor and wash systems, the MatWash 360° cleans the entire mat using a high-pressure pumpsand cleaning nozzles that scour the mat from every angle even into the deepest grooves and gouges. Plus, the MatWash 360° cleans your rig mats quicker, over ten times faster than a manual wash system, saving you time and money. In Western Canada’s oil and gas, utilities, remediation, mining, and construction industries, one of the biggest concerns is contamination – in particular, the spread of clubroot, a soil-borne disease that affects the country’s agriculture industry. A challenge in Alberta, clubroot largely impacts the farming industry (with canola, mustard, and cole being particularly susceptible) by destroy crops and creating yield loss. Spread through soil disturbances (especially contaminated machinery such as rig mats and drilling equipment), prevention is vital to reducing the spread and impact of this destructive disease. As a result, oil and gas companies are adopting prevention and sanitization practices to reduce its spread and prevent the work they’re doing from impacting the agricultural industry. One of the surest ways to reduce contamination of clubroot,noxious weeds, and otherinvasive speciesis to use the MatWash 360° system to clean and chlorinate your rig mats. The MatWash 360° system also collects and recycles wash water using WaterSafe technology, saving nearly 1,000 litres of water per matt wash. Custom built with a state-of-the-art filtration system, the MatWash 360° offers a heavy-duty recycling process that can withstand even the toughest contaminants, allowing us to recycle water, treat wastewater, and reduce the overall environmental impact of washing our customers’ rig mats. An efficient system that reduces mat hauling costs (clean mats weigh less), sending your rig mats to Little Guy is good for your budget, over both the short and long term. As industry leaders, we pride ourselves on the MatWash 360° system’s superior performance and its ability to improve our customer service. Washing a rig mat is 10 times cheaper than buying a new one, and cleaning your mats extends their life cycle, putting your dollars to work longer and harder while also ensuring that your mats are sanitized for the next job. If you’re looking to get your mats washed or just looking for more information feel free to reach out to Little Guy using our LittleBot or call us toll free at 1 (888) 966-9364.